It’s easy to pull out all the stops with your holiday decor when you have a sprawling home with cavernous rooms, high ceilings and front and back yards. But what happens when you live in a small apartment with no private outdoor space? 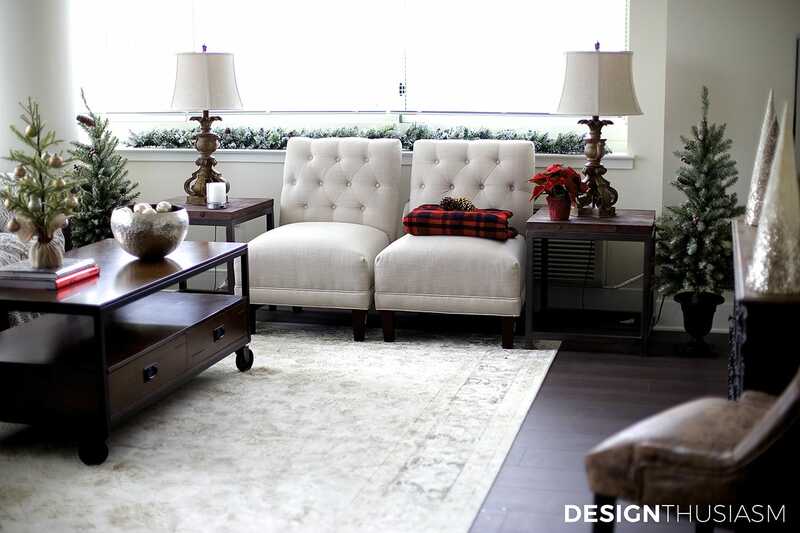 If approached creatively, there’s no reason your limited space should limit your holiday cheer. 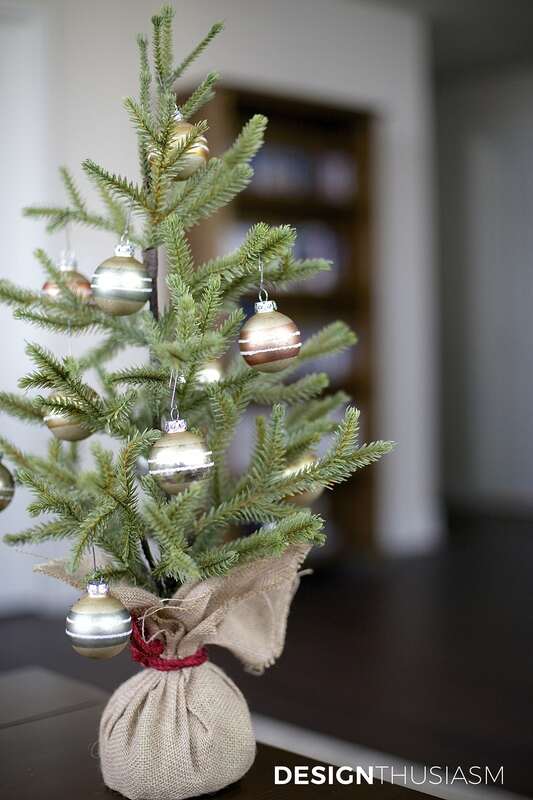 Here are 12 easy holiday decorating ideas for a small apartment! 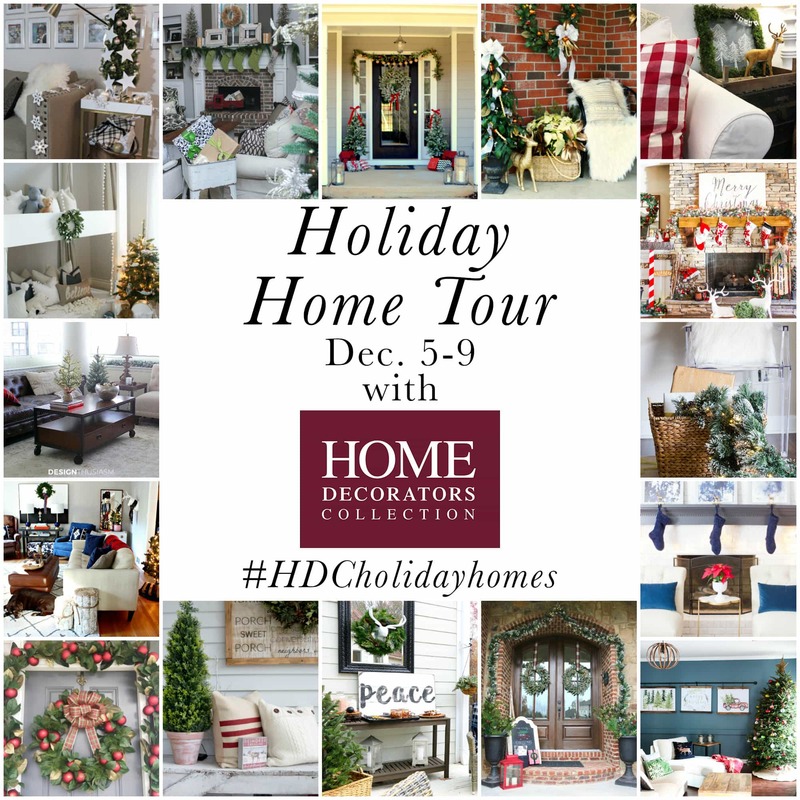 I’m thrilled to be partnering today with Home Decorators Collection® as part of their HDC Holiday Homes. While this post was sponsored, all opinions are my own. In fact, I chose to do this post at my son’s apartment because almost every piece in his home was already from Home Decorators! The apartment is brand new and modern, in a high rise building with two walls of windows allowing in plenty of light. The kitchen and living room are connected and that is the area I styled for this post. 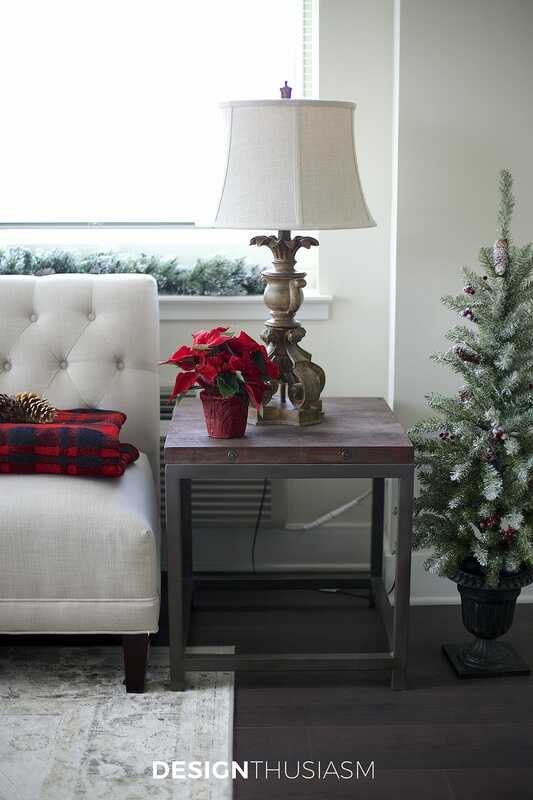 The space is small, but we were still able to utilize these 12 festive ideas. 1. 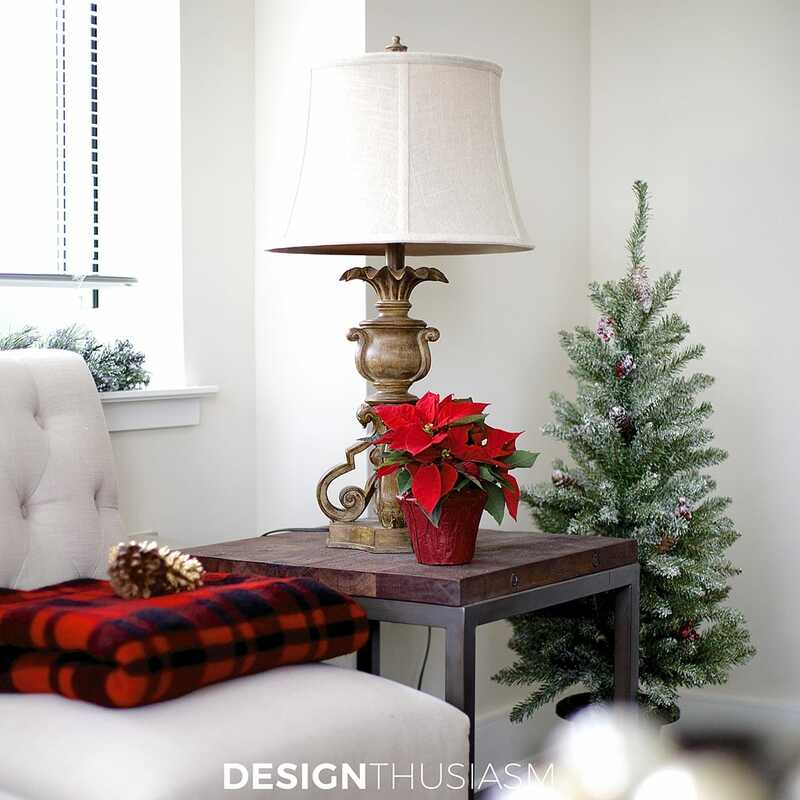 Tartan Plaid Pillows – The decor in this apartment is normally very neutral, so the infusion of holiday color is probably the single most impactful thing we could do to spice it up for the holidays. 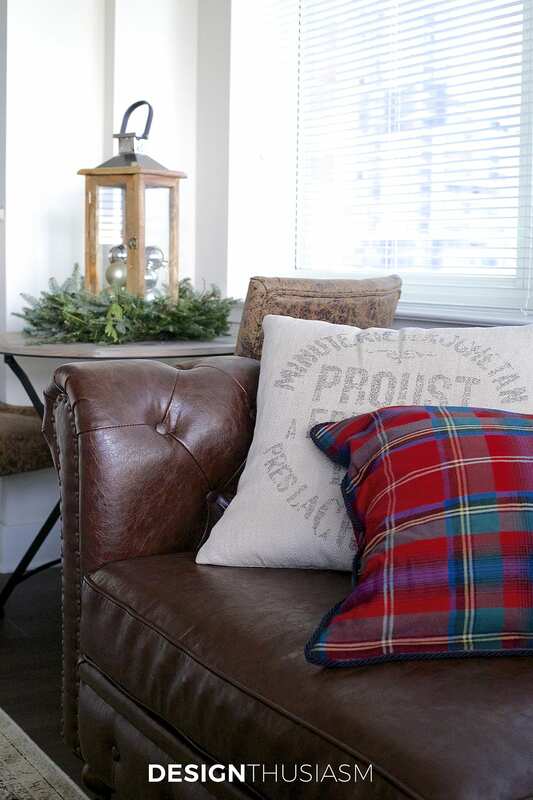 The red tartan pillow below works really well with the neutrals and yet is a bold seasonal cue. 2. 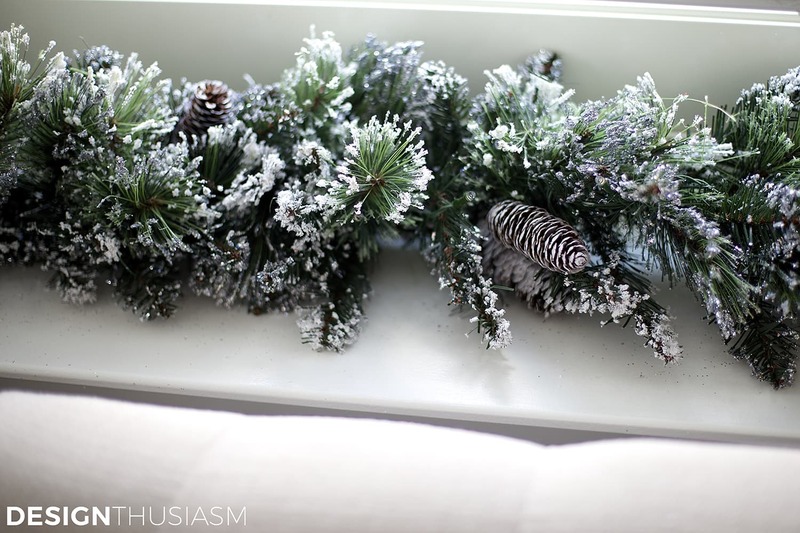 Glistening Pine Garland – With no mantel or even a sideboard to drape a garland over, we used the window sill to display this beautiful snowy garland. It lights up for evening and when placed on the wrap around sill, it envelopes the room in wintery goodness. 3. 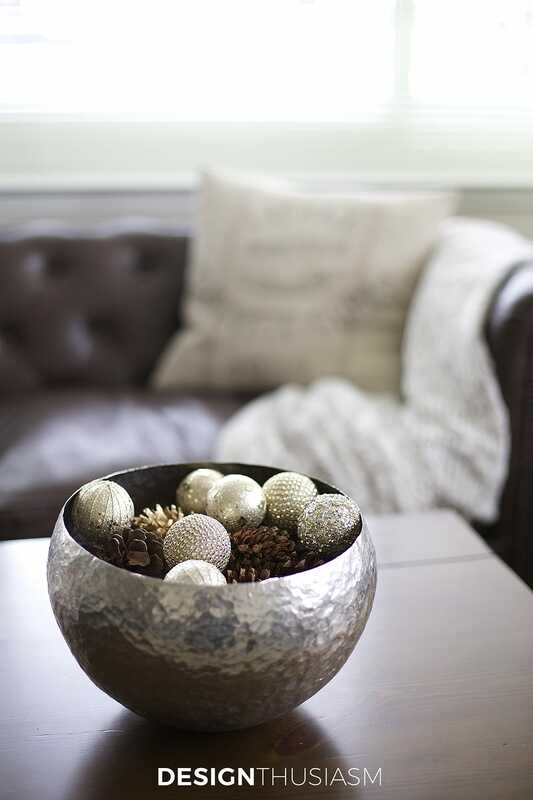 Bowl of Orbs and Pine Cones – Perhaps the easiest Christmas decor trick ever, a bowl full of glittered ornaments and natural pine cones can be added to even the tiniest room. 4. 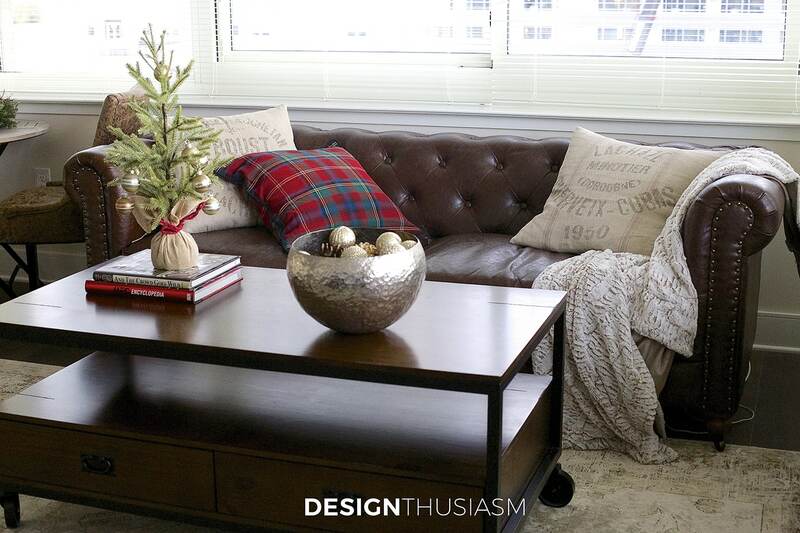 Faux Fur Throw – Nothing says ‘cozy winter home’ quite like a faux fur throw. Who wouldn’t want to wrap up in one of these as the temperatures plunge, especially in an apartment without a fireplace? 5. Fresh Wreath – With only a bar counter between the galley kitchen and the living room, my son has a bistro table tucked into the corner of the room. If you have solid walls in your home, you can easily find a place to hang a wreath, but with wall to wall windows, we used the wreath on the dining table. A faux one would also work, but with no outdoor space, it’s nice to have the smell of fresh greenery in the apartment. 6. Glittered Cone and Bottle Brush Trees – The only wall that’s not windowed is dominated by a large TV. 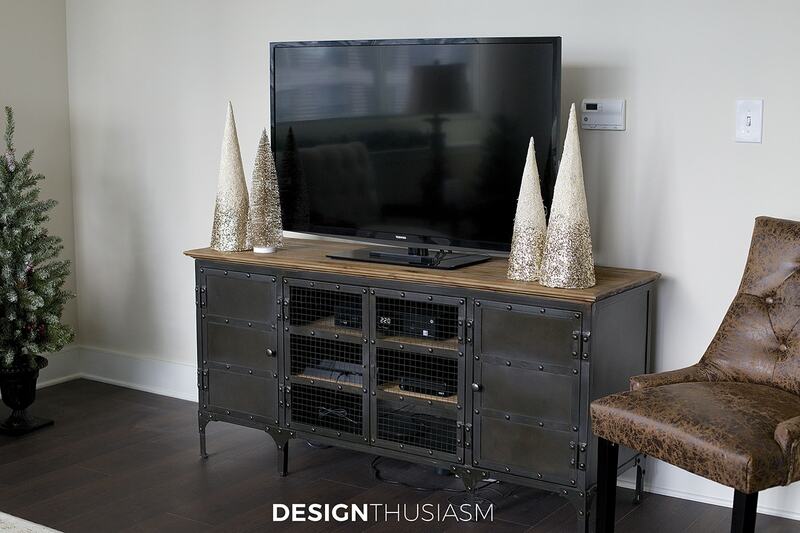 Flanking the screen with these jovial trees adds holiday cheer to this side of the room, without blocking the viewing screen. 8. 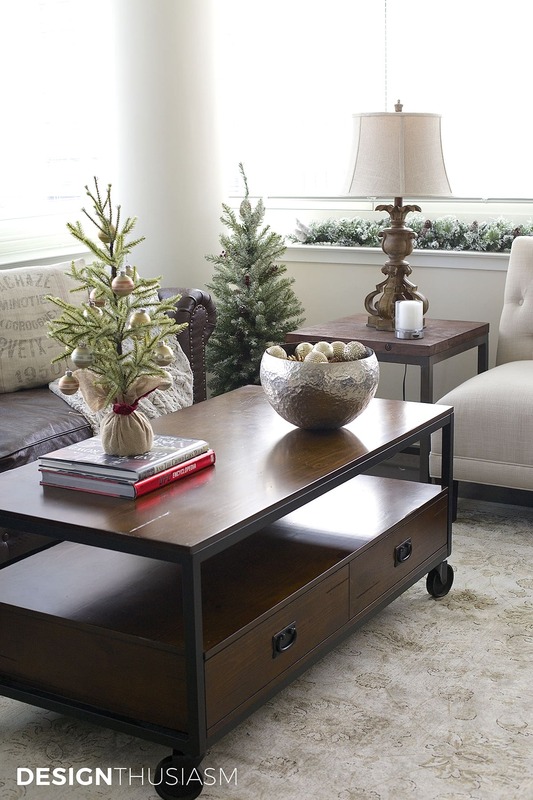 Small Poinsettia – It’s always nice to have live plants at home, and this sweet little poinsettia on the end table is another opportunity to add a pop of seasonal color. You don’t need a huge front entry lined with stepped poinsettias, when a tiny plant will make the same statement in your space. 9. 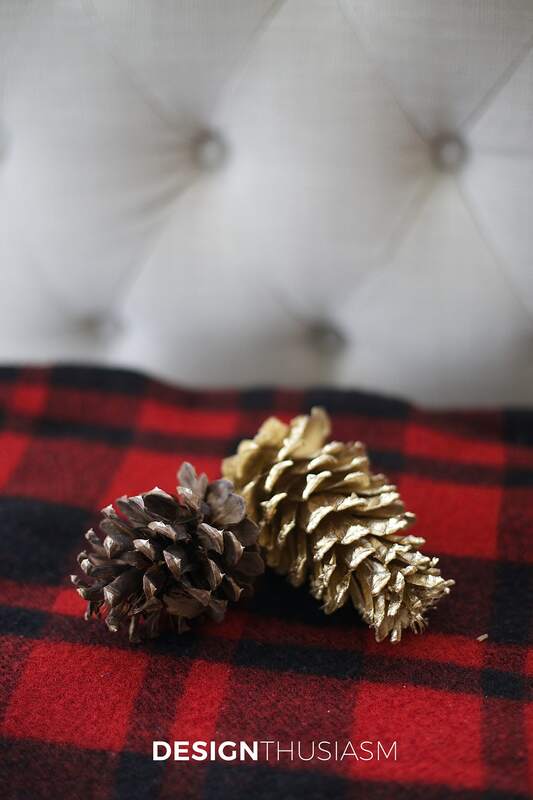 Woolen Plaid Blanket – For another shot of seasonal red, a chunky blanket in a woolen plaid looks great folded on an occasional chair. Toss a few pine cones on top to really drive the point home. 11. 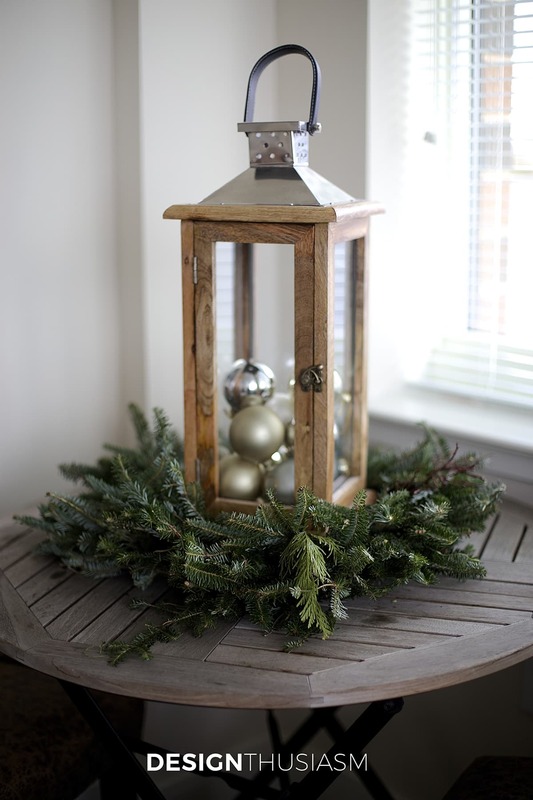 Fresh Holiday Greenery – Draped along the counter and stemming from the lantern I placed fresh holiday greens. These could also be used in an arrangement or tucked into any number of spots. This is one of the easiest and most versatile ways to decorate a small space. 12. Fir Entrance Trees – I saved the best for last! 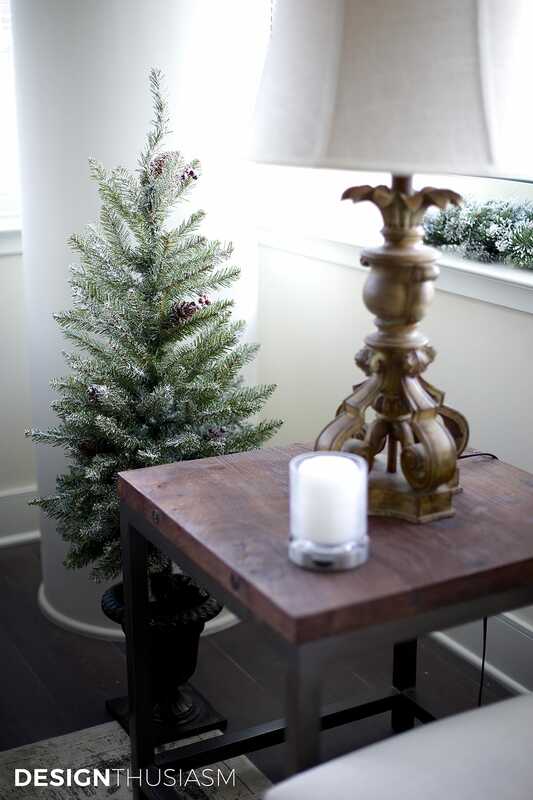 I’m crazy about these fir entrance trees and they can be placed around a room in a number of ways. I had originally planned to have them flanking the TV, but I’d forgotten about a new chair that was added there. Instead I preferred seeing them in a more dominant position, facing us as we enter the room. 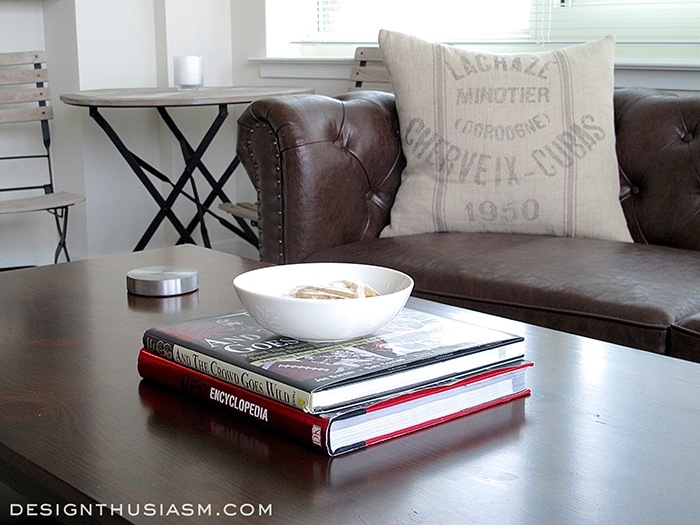 The key in decorating a small apartment is to use things in ways that work for your unique space and not to worry about what they were intended to be used for. If you don’t have a large entry way, and you can’t fit a full sized tree, go for the entrance tree and place it anywhere your heart desires! Please join us throughout the week to see all of the home tours. Here’s this week’s lineup! What a great apartment! Every bit of space so well appointed. I loved how you did his bedroom in a previous post. What a great space and lucky guy! WOW! Thanks, Julia! Can’t wait to see yours!! These are great tips! 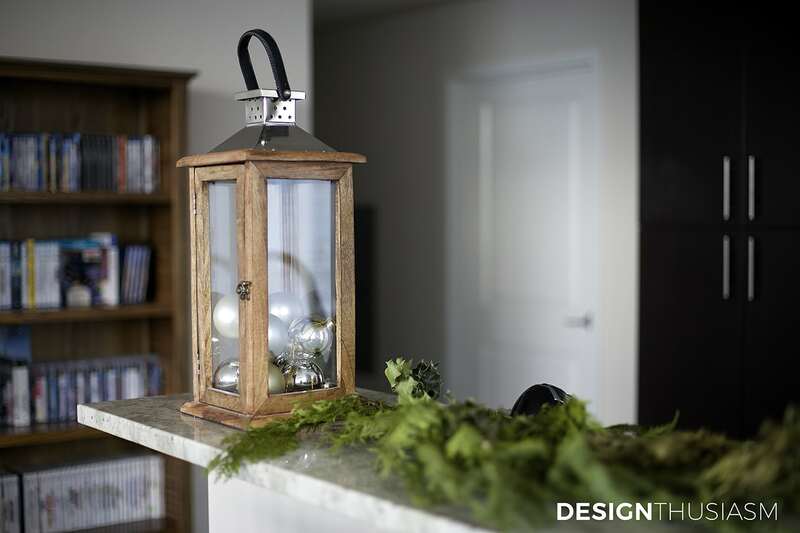 Love the ornaments in the lantern! Wow, I love it all. Great post!!! Just enough to feel like Christmas but still manly. Great touches! You have done a great job of decorating your son’s apartment! what a great apartment. you have done an amazing job with the furnishings and decor. It’s perfect for your guy. Beautiful job! Love everything you chose from Home Decorators Collection. Really love this- I know you both are happy. Well done !!! What a great looking apartment! I love how you decorated in both a masculine yet festive way for him. Home Decorators really has a lot to choose from. I wish they still had their store open near Maplewood but at least they can still be ordered online. I actually really look forward to your comments, Norma!! Thank you, thank you!